In this article we will delve specifically into why the average NYC real estate commission has stubbornly remained at 5-6% and how an enterprising home buyer or seller can secure a NYC real estate commission rebate. Why Are NYC Real Estate Commission Rebates Uncommon for Sellers? How Can Home Buyers Get a NYC Real Estate Commission Rebate? Can I Get a NYC Real Estate Commission Rebate If I’ve Already Reached out to the Listing Agent? How Do I Loop in My Buyer’s Agent If I’ve Already Directly Contacted a Listing Agent in NYC? Can I Involve My Buyer Agent If I’ve Already Made an Offer Directly in NYC? The reason why traditional For Sale By Owner (FSBO) hasn’t caught on in New York City is largely due to the fact that most real estate brokers in NYC are not affiliated with the National Association of Realtors (NAR) and as a result there is no dominant Multiple Listing Service (MLS) inter-brokerage database in NYC. Instead, most real estate brokers in NYC (especially Manhattan and more expensive parts of Brooklyn) are members of REBNY (Real Estate Board of New York) which is a private, local real estate trade association. REBNY operates an inter-broker database similar to a MLS in other parts of the country called RLS (REBNY Listing Service). You can compare the RLS to a hub and spoke model. RLS is the hub and because all REBNY members are contractually required to keep listing information updated, the data is typically more updated and accurate than those on public search websites like the New York Times or StreetEasy. You can compare the RLS to a hub and spoke model. This is a major, often misunderstood reason why using a real estate agent for your home search can be very helpful, they simply have better and more accurate data! While there is no actual interface or website for RLS, all REBNY member firms can access RLS listings through an approved RLS vendor such as Nestio, OLR, RealPlus or RealtyMX. Now because REBNY as a local, private organization does have leeway in which members they will admit (for example, the membership application for REBNY asks for two sponsoring signatures of principals of current REBNY member firms), national “for sale by owner” websites have either not bothered or failed to gain access to the RLS. As a result, the national FSBO websites continue to advertise listing packages that will list your home in your local MLS for upwards of $1,000 or more. Unfortunately for home owners who do not understand the local dynamics of New York City real estate, ordering such a package can be a complete waste of money. Beware any large, national FSBO website that promises you such a local “MLS” listing without specifying which brokerage database exactly you will be listed in. In most cases they will simply list NYC home owners in the New York State MLS which as you can imagine is almost completely irrelevant as no NYC brokers actually use that database! Moreover, even if one day they are able to attain access to the RLS most of these national FSBO websites will not be able to provide you with the NYC real estate commission rebate you sought because they advertise non-standard flat fee MLS listings under their own brokerage or trade name. As you can imagine, over time and with reasonable volume most local brokers will pick up on the fact that certain brokers aren’t really there and begin to either avoid or ignore the listings of said “flat fee” broker. As a result, even by offering a commission to buyers’ agents in the right broker database will do you no good if your listing broker is a known flat fee listing broker. Hauseit is the only firm that will get you access to the right NYC inter-broker databases without compromising the image and reputation of our network of partner listing brokers. All of our partner brokers are highly rated, brand name, traditional real estate firms who do not normally discount their services openly or in any way. As a result, all of our broker partners have great working relationships with the wider brokerage community, and your listing will be blended in with their normal commission listings. We will make sure your home is advertised on relevant local consumer search websites like the New York Times, Brownstoner, StreetEasy and that you’ll be able to engage all local buyers’ agents through the RLS. There are several nuances you must be aware of even after you’ve signed up with a buyer’s broker offering a buyers’ agent commission rebate. Since you be getting a rebate of $20,000 or more from the built-in broker fee that the seller will pay regardless of whether you are represented or not, you must expect to do some of the searching and work yourself. Typically, expect to do a large part of the searching yourself and add properties you’re interested in to a list. Once you have a list of properties you’re interested in, make sure to send the property links to your agent offering the NYC real estate commission rebate. It is very important that you do not reach out to any listing agents (at least not in your name) directly. The reason this is important is listing agents document very carefully how the “first substantive contact” with a potential buyer is made. If it’s direct, then the listing agent may be able to not allow any buyers’ agents to subsequently try to get involved. This is why it’s very important you send the list of properties you’re interested in to your buyers’ agent who will then proceed to sign you up for open houses and viewings. The most convenient situation for the buyer’s agent is if they sign you up only for properties with open houses so that they won’t necessarily have to chaperone you. Private viewings can be difficult as the listing agent may expect or even request the buyers’ agent to accompany the buyer. As a result, NYC real estate commission rebates are uncommon in boroughs with a lower price point and farther away because agents will not want to accompany buyers to viewings that are so far away plus give away a rebate. However, due to the high NYC real estate commissions in Manhattan, you will have better luck receiving a rebate for your home search. Despite the rebate, at these price points it is simply worth it for the agent. A buyers’ agent may very likely even be willing to provide full service plus a substantial rebate if a home is more than a million dollars in Manhattan! Note: If you’ve reached out to a listing agent already, it’s not the end of the world! You have the right to choose separate buyer representation at any point and a seller’s broker must honor your desire to work with a broker of your choice. Practically speaking however, you really must involve your new buyer’s agent before an offer has been submitted and then accepted. If you try to loop in a buyer’s agent after you already have an accepted offer, the listing agent can make a credible case that your buyer’s agent was not the procuring cause of the deal and therefore ineligible for any commission. 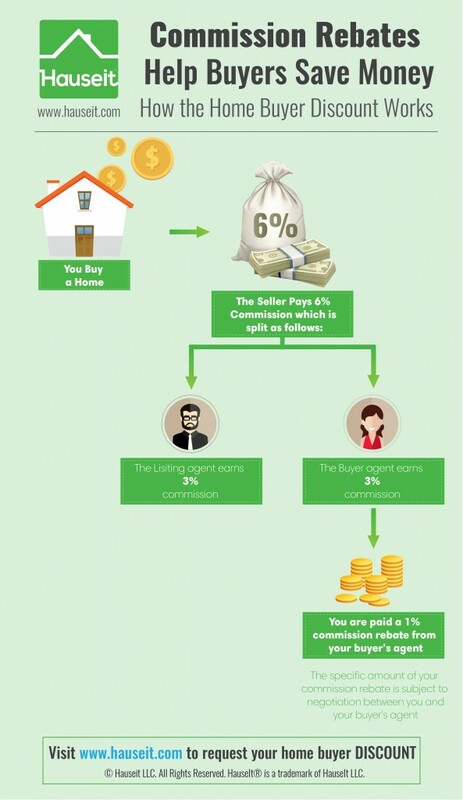 Do real estate agents have to split commission? Surprising, the answer is no unless there is a pre-existing agreement between the brokers such as mutual membership in a MLS or REBNY in the case of NYC. Therefore, it’s not so simple to get a listing broker to co-broke with you just because you or your spouse happens to have a broker’s license on the side. Can I Get a NYC Real Estate Commission Rebate If I've Already Reached out to the Listing Agent? You are free to elect a buyer agent representative at any stage of the transaction. While it is preferable and more courteous to allow your buyer agent make first contact with listing agents, it is not the end of the world if you’ve already reached out directly. This sort of thing does happen quite frequently, especially for “hot” properties where the listing agent is being inundated with inquiries and is slow to respond to buyers’ agents. In these situations it is quite common for impatient buyers to stop waiting for their buyers’ agent to get back to them and to instead inquire directly with the listing agent. Here is what REBNY Counsel has opined on the issue of buyer representation in New York City. Is a buyer always entitled to be represented in a transaction? May a listing broker refuse to work with a buyer’s broker if the seller has specifically asked the listing broker not to do so? Is a buyer’s broker entitled to a commission by virtue of introducing the buyer to the property? No, simply showing a buyer a property does not necessarily entitle a REBNY member to a commission. A broker is only entitled to a share of the commission if he or she is considered the “procuring cause” of the transaction. There is no specific definition of “procuring cause.” However, case law suggests that in order to be considered the procuring cause, a real estate broker must show a “direct and proximate link between the bare introduction of the buyer and seller and the consummation [of a sale].” In other words, a REBNY member must bring together a meeting of the minds between the buyer and seller and show that he or she generated a chain of circumstances which led to the sale. The ultimate determination of whether or not the REBNY member procured the buyer, and thus can be considered the procuring cause, is a fact-sensitive inquiry that turns on the specific facts and circumstances of each case. May a buyer switch real estate brokers at any time during a transaction? Yes, absent an exclusive representation agreement, a buyer may switch real estate brokers at any time during a transaction. However, the buyer’s decision to change brokers does not necessarily dictate which broker is the procuring cause of the buyer. For example, let’s assume that Broker A represented the buyer for the entire transaction and, on the night before closing, the buyer instructs Broker A not to come to the closing because the buyer wants to bring Broker Z to the closing. The buyer has the right to change to Broker Z, but doing so does not negate the fact that Broker A was the “procuring cause” of the buyer. In this case, Broker A would still be entitled to share in the commission even though the buyer has changed brokers. Once again, the determination of who is the procuring cause of the transaction is a fact-sensitive inquiry that turns on the specific facts and circumstances of each case. How Do I Loop in My Buyer's Agent If I've Already Directly Contacted a Listing Agent in NYC? You can simply reply by email to the listing agent and mention that you are copying your broker whom you’ve been working with. Even if you are on your way to a private showing that you scheduled directly, you can copy your buyers’ agent on an email to the listing agent and give them a courteous heads up that your buyer agent will be attending as well. You really need to stick up for your buyer’s agent if you’ve already led the listing agent on into thinking that you’d be up for dual agency, then you should send a separate email to the listing agent informing him or her of your desire for dedicated buy side representation. You can mention that your lawyer has recommended that you get a buyer’s agent to guide you through the purchase process since you are a first time home buyer, and that you definitely agree that you’ll feel more comfortable with the guidance of an experienced agent who’s only working for you. Keep in mind that this won’t be possible if you work with your typical mom and pop rebate broker. If you loop in a shady discount broker after you’ve already made contact with a listing agent, your ploy will be immediately discovered by the listing agent and seller. That’s perhaps one of the easiest ways to jeopardize your deal! It doesn’t take much for a listing agent to Google this mom and pop rebate broker you’ve mysteriously looped in, and once they easily find out what they’re up to then their blood will really boil! You can expect this listing agent to call just about every other buyer to try to shop your pending offer. Furthermore, the seller will harbor resentment towards you because he or she will know you are getting a better deal. What’s the point of getting a rebate if the seller knows about it and thinks you’re cheating? The only way to avoid this conundrum is to work with a high rated, brand name, traditional real estate broker who does not normally or openly discount their services. Hauseit’s broker partners are all highly rated, local REBNY Member Firms with great working relationships with the wider brokerage community who have discreetly agreed to provide you with a NYC real estate commission rebate post closing. Know one will know you are getting a better deal! It’ll be our little secret! Can I Involve My Buyer Agent If I've Already Made an Offer Directly in NYC? This is not preferable since it would be debatable whether your buyers’ agent is the “procuring cause of the sale,” especially if the offer you made directly is accepted without further negotiation or involvement by your buyer agent! You are of course free to elect representation at any point in time; however, if you’ve already made an offer directly it will be questionable whether your buyer agent is able to secure commission on the deal. It is highly advisable that you consult your buyers’ agent before you submit an offer. This is especially relevant for home buyers who want to secure a buyer agent commission rebate and have already set their heart on a property they want to buy. In this case, it is not necessary for your buyer agent to view the property. However, it is extremely advisable for you to consult your buyer agent before submitting an offer. Your buyer agent representative should submit the offer and negotiate on your behalf!